Good morning to all of you and welcome to Thursday. The week is coming to an end soon, and today is also the two week mark until Christmas. On another note, these days, there are all kinds of scientific discoveries being made about giant creatures, and sometimes, the bodies of giant beasts have been found and turned over to the scientific community for study. The common housefly is not known to be a giant creature, but that may all change now because of today’s optical illusion. This poor man was walking down the street when he was attacked by a giant fly and had to defend himself! The giant fly was killed, but was it even real at all? 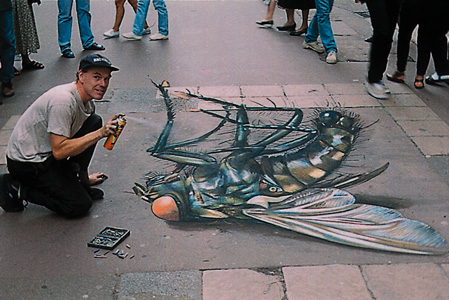 Well, you all can breathe a sigh of relief because it was just a chalk drawing, but it looks real does it not? It’s two weeks to Christmas, and we know of a way to cheer you all up! Look at some great smiley faces, and hopefully, they will make you all feel happier. These are pictures of accidental smiley faces, and they sure are something. Guess when you smile, the world really does smile back at you and here is the proof of that! Hope you all have a good Thursday. It’s a good drawing, but it is not very real looking. Is the bug spray drawn too?